Bangladesh should readjust its foreign policy in line with the changing global dynamics to make 'real' friends by transforming the small delta into a hotspot for foreign direct investment (FDI), experts suggested on Wednesday. According to the speakers, the recent Rohingya exodus has shown Bangladesh really does not have friends to count on, although the main principle of the country's foreign policy is friendship with all and enmity with none. Stressing on the importance of increasing regional connectivity, they said the foreign policy should concentrate more on SAARC (South Asian Association for Regional Cooperation) and BIMSTEC (Bay of Bengal Initiative for Multi-Sectoral Technical and Economic Cooperation), and make regional corridors like BBIN (Bangladesh, Bhutan, India and Nepal) and BCIM (Bangladesh, China, India and Myanmar) active. The suggestions and observations were made at a seminar on 'Changing Global Dynamics: Bangladesh Foreign Policy' hosted by Bangladesh Institute of International and Strategic Studies (BIISS) at its Eskaton office in the city. Foreign Minister Abul Hasan Mahmood Ali was present as the chief guest in the programme. "In this (Rohingya) crisis time, no one from our region stood beside us. Why did it happen so?" 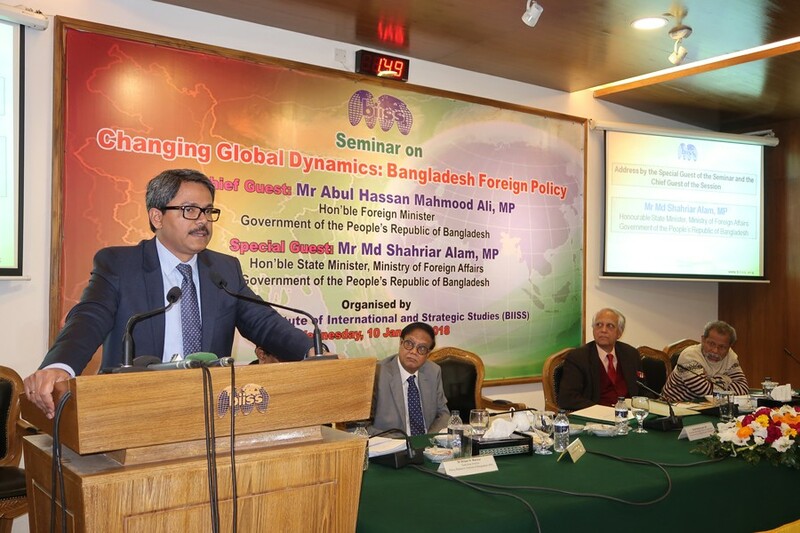 Executive Director of Policy Research Institute (PRI) Dr. Ahsan H Mansur said while talking on economic development and Bangladesh foreign policy. It is evident that despite having sour relationships, China and Japan are on the same boat when it came to Myanmar. Moreover, India and China have also managed to keep their enmity aside and essentially sided with Myanmar. He also said it is investment and economic interests that determine the relations between the countries, and the associated political support. The countries like China, Japan and India do not have much FDI exposure in Bangladesh comparing to Myanmar. This unfortunate situation is mostly due to Bangladesh's failure in attracting FDI, and the perception about future potentials for investment in Bangladesh economy. "The cumulative FDI in Myanmar stood at around US$ 75 billion, whereas it is less than $ 14.5 billion in Bangladesh. So, we have to bring overseas investors in a large number, and the foreign policy should focus on that," he added. Presenting the keynote paper, Director General of BIISS Major General A K M Abdur Rahman said the world is passing through a transition period because of growing incidents of terrorism. Besides, protectionism seems to be on rise because of many factors, as the US pulled out of TPP and climate change negotiation as well as Brexit etc. At the same time, the issues like North Korea and Rohingya are giving signals of changing global dynamics of politics, and the country's foreign policy should be in line with this. Abul Hassan Mahmood Ali mentioned eight priorities, putting "deeper engagement with Europe" on the top of these priorities. The foreign minister said as a natural connector between South and South-East Asia and beyond, Bangladesh will continue to pursue regional cooperation as an engine for sustainable growth and economic integration through SAARC, BIMSTEC, BBIN, SASEC and BCIM. Given the shared political, cultural, social and economic history over centuries, he said India has been the country's most important partner. "In bilateral relations with Myanmar, the issue of Rohingya influx remains as an irritant. With the repatriation of the Rohingyas under the arrangement signed on November 23, 2017 we hope to have a new beginning with Myanmar." While talking about the country's economic interest, the minister said the government will continue to forge effective partnerships with other countries to secure economic benefits. "We have already developed such partnerships with India, China, Japan, the UK and the US in the recent years across mega infrastructure, power and energy sector projects," he added. Ministry of Foreign Affairs (MoFA) State Minister Md. Shahriar Alam said the country has to be prepared for the necessary requirements of GSP (Generalised Scheme of Preferences) plus once it gets out of the box of LDCs (least developed countries). "So, we've to take necessary preparations from all quarters, including diplomats and business community." About FTA (free trade agreement), he said Bangladesh is the 46th largest economy of the world, and it is the only among these 46 countries who has no FTA with other countries, which is not acceptable at all. "We're working to have FTA with Sri Lanka. At the same time, we've decided to open the book of FTA again after a break. We're talking with some other countries to have PTA (preferential trade agreement)," he added. MoFA Secretary Md. Shahidul Haque said the foreign policy prioritises a broader and deeper relationship with the European Union (EU), especially with France, Germany, the UK, the Netherlands and Sweden. "We've strategic relation with Asian superpowers - India and China. Relation with India is, in fact, beyond strategic, while strategic relation with China is shifting to partnership." He also said the foreign policy has shifted from land-focused to ocean-based to properly explore Blue Economy. Mr Shahriar said it is difficult to maintain relations with China and India -- the two big powers -- but the government is maintaining balanced relations with the two countries. Dr. Imtiaz Ahmed, Professor of International Relations of Dhaka University, emphasized maintaining a balanced relation with China and India to get maximum benefits. Former Chief Information Commissioner Ambassador Muhammad Zamir, BIIS Chairman Ambassador Munshi Faiz Ahmed and Professor Tasneem Siddiqui of Dhaka University, among others, also spoke at the function.